As I mentioned last week in the first of this three-part primer on WiFi radios, I never thought a WiFi radio was something I’d ever acquire. 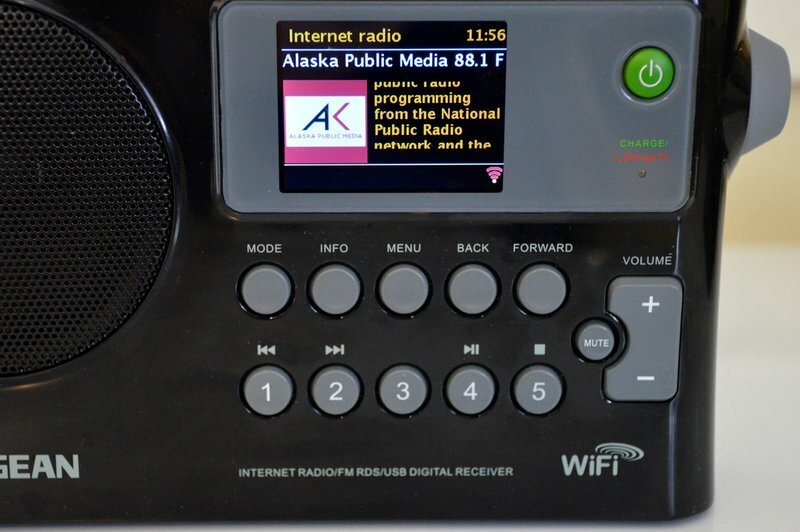 By “WiFi radios,” of course, I mean Internet radio devices that have the sole purpose and dedicated function of streaming radio audio, and so, as a die-hard ham with a penchant for a well-balanced tuning knob, I just couldn’t see the need for what I thought of as an overly-simple, perhaps even redundant, device. Fast-forward several months. Now that the XYL and kids have been using WiFi radios for a while, I don’t think they’ll go back. And as for myself? Yes, I’ve crossed that no-return boundary, too. Our whole family’s now joined the WiFi radio club, and the truth is, we’re all enjoying the WiFi’s simplicity and unique benefits. In Part 1 of our WiFi Radio Primer, we discussed what makes WiFi radios tick––their ability to find radio stations via radio station aggregators. We also discussed the comparative merits of the most dominant aggregators on the market, and took a look at one easy alternative to the WiFi radio, namely, streaming from your smartphone or tablet. Now we’ll investigate some of my picks from the current market. 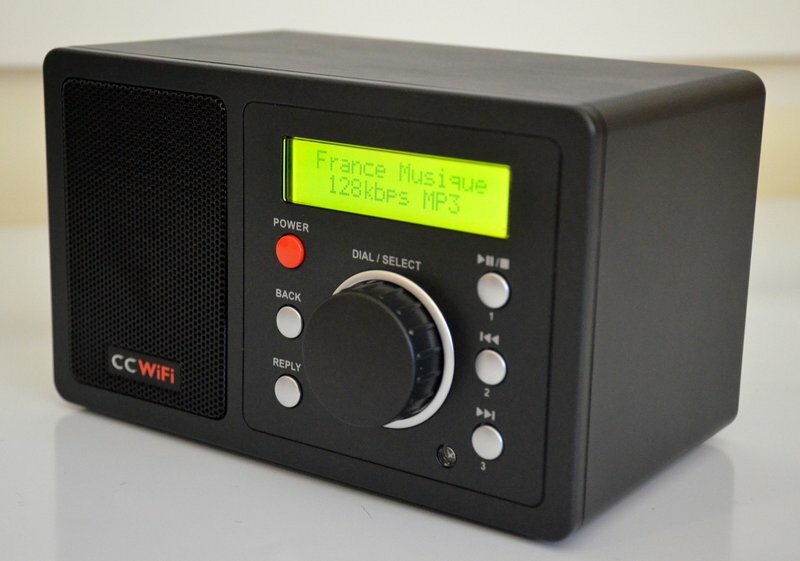 WiFi radios, by and large, look like traditional radios; they typically have backlit digital displays, front panel buttons to recall memories, and an internal speaker. They function like them, too, in that they play radio stations––but there’s where the resemblance stops. Streaming lnternet audio, and their dependence upon an aggregator to do this, sets them entirely apart. 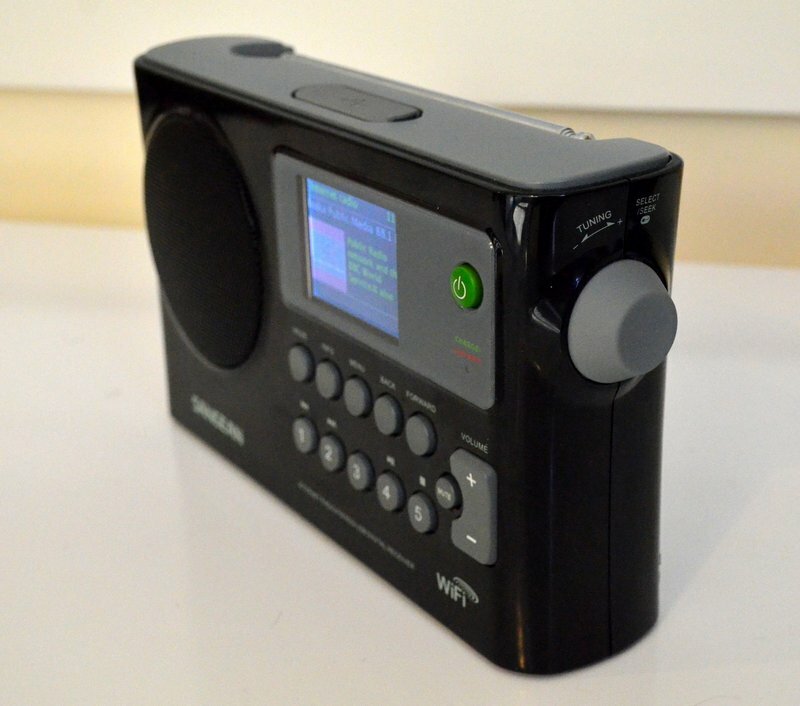 The market for WiFi radios is actually not as broad and diverse as the shortwave radio market. 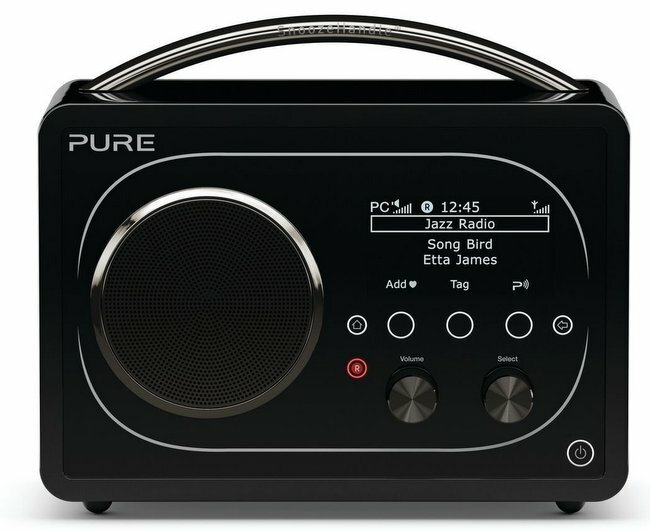 If you’re seeking a quality device that uses a well-known, properly-curated station aggregator (again, see Part 1 for more on this), you’ll be looking at about a dozen (or so) radios currently on the market. 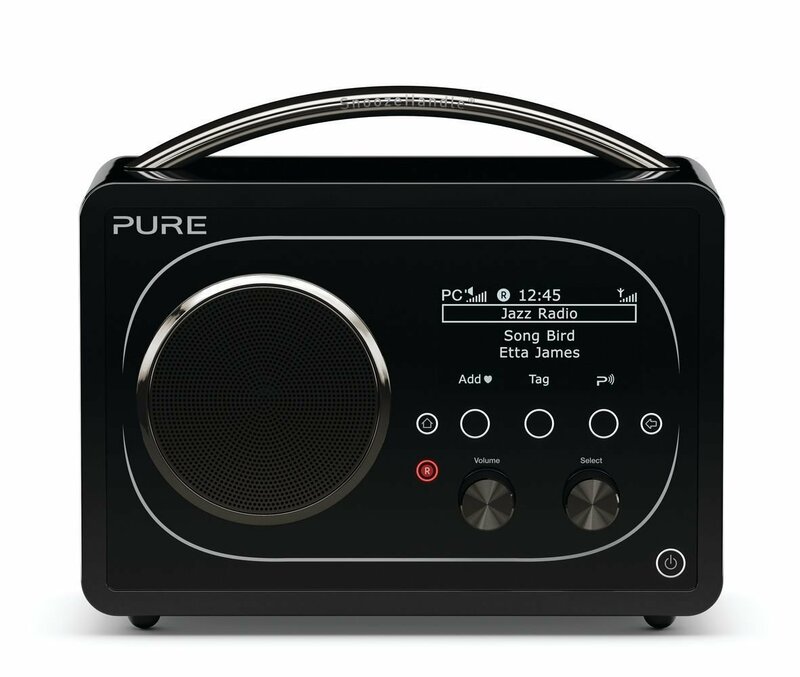 Here’s a short list of the current market’s most popular WiFi radios. Note that this is by no means a comprehensive list––it’s a curated list of WiFi radios that are in wide use, are relatively simple to operate, have built-in speakers, and that use reliable aggregators. I’ve noted the aggregator in parentheses as well as the average US purchase price. 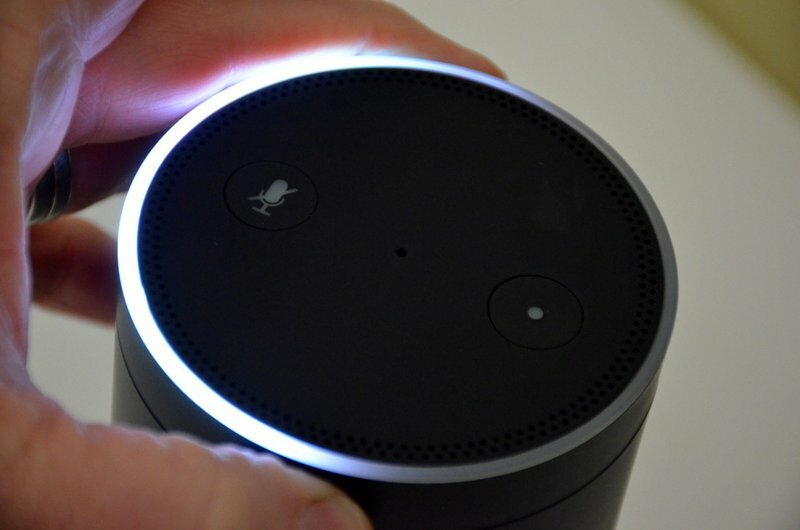 After much research and head-scratching, I chose four WiFi radios from the above list: the C.Crane CC WiFi, the Sangean WFR-28, the Grace Digital Mondo and the Amazon Echo. FYI––and in full disclosure––here’s how I obtain my review radios. To keep my review budget within reason, I contact a supplier and request a loaner unit for review that I may return or purchase afterward; otherwise, I purchase the unit(s) outright. 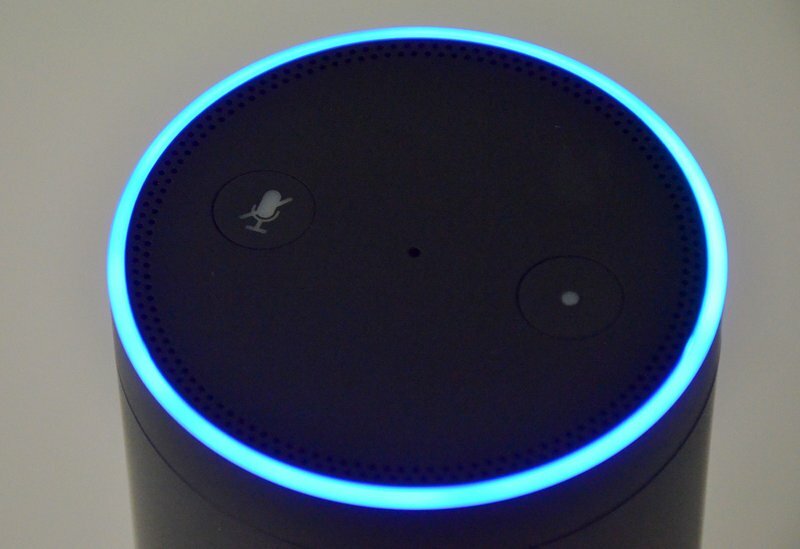 In this case, I purchased the Amazon Echo ($179), Grace Digital Mondo ($150), and rechargeable “D” cells for the WFR-28 ($30), while both C.Crane and Sangean kindly opted to send sample review radios, this being a less expensive route for these retailers. When I receive samples, my policy is to give away those I don’t wish to keep; for those I do decide to keep, I donate the full retail price to Ears To Our World, a 501(c)(3) non-profit which sends self-powered shortwave radios to teachers in off-grid developing world communities. Several friends urged me consider the Pure EVOKE F4, which reportedly has excellent audio, a simple interface, and superb customer support. 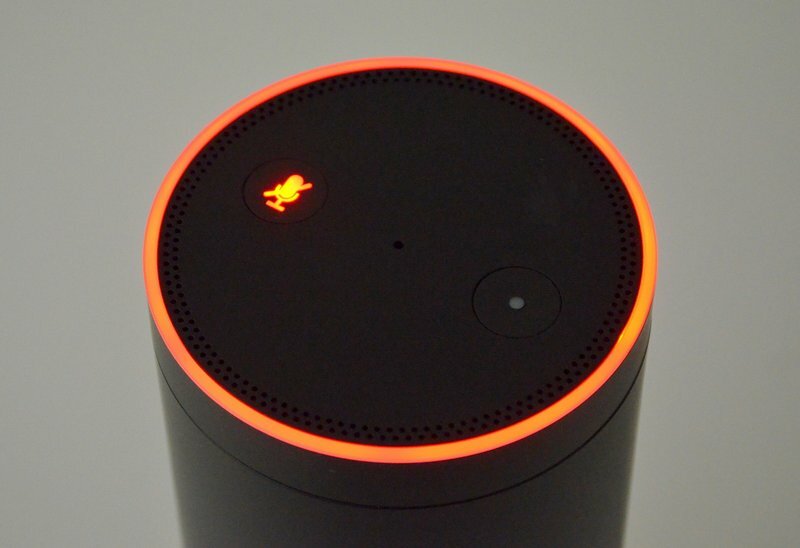 Plus, it’s a sleek little device, and…well, frankly, cute. Many have also touted Pure’s own proprietary aggregator, as well. But I just couldn’t justify purchasing and reviewing a WiFi radio with such a hefty price tag ($225), especially knowing that I would also need to purchase the optional battery pack ($50) for a total performance picture. Following are summary reviews of each radio I tested. These are not comprehensive reviews covering every feature; rather, in these summaries, I focus my analysis on their ability to tune stations, on audio quality, on portability, and simply on general usability. I’ve had many C.Crane radios in the past. I love C.Crane products because they’re typically well-designed, effective, and because C.Crane offers excellent customer support. 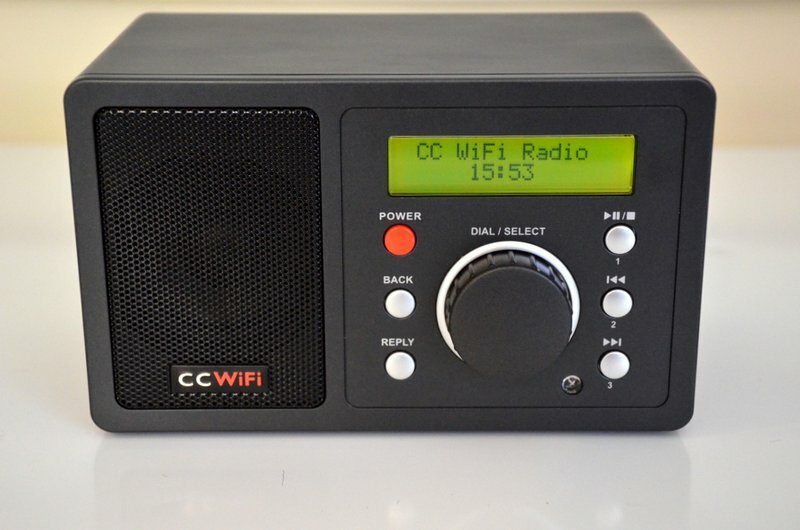 The CC WiFi radio has been on the market longer than any other WiFi radio reviewed here. When I first unboxed the CC WiFi, I was a little surprised by its diminutive size: it is, perhaps, 30% smaller than I expected (based solely on web images and from the catalog). It comes with a small remote control with blister/membrane style buttons. The front panel on the CC WiFi is very simple: one large knob, six buttons, and a monochrome backlit two-line alpha-numeric display. The front panel of the CC Wifi is simple and intuitive. The main knob acts as both a selection dial and volume control. Setup is fairly easy; the accompanying owner’s manual walks you through the process (another C.Crane strength is their production of good-quality manuals). Once I had set up the radio and registered it with the Reciva aggregator, I was tuning in the world. The CC WiFi’s plastic chassis feels rather thin––at least, thinner than I would have expected. But the radio is surprisingly lightweight, perhaps as a result of this. Fortunately I was pleasantly surprised by the audio from the internal speaker. It provides a full sound and is more than adequate for medium-sized rooms. Bass tones are present, though not especially deep. It’s wonderfully balanced for the spoken word. 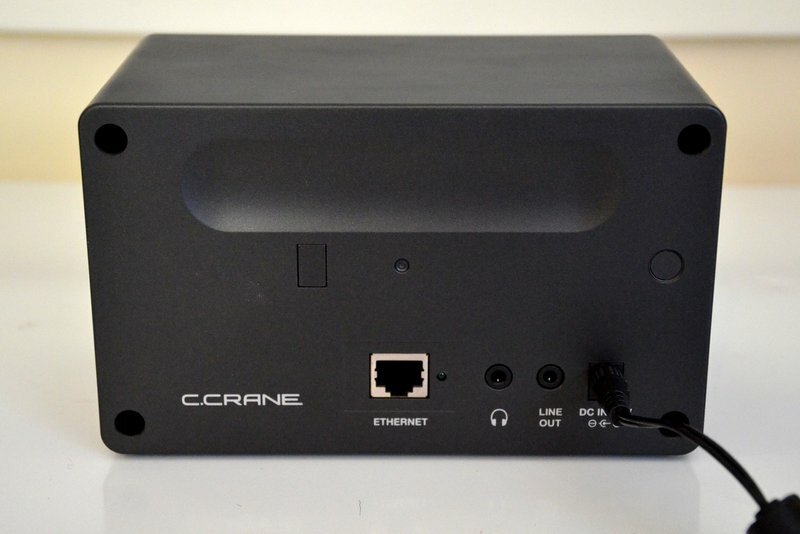 All of the external ports are on the rear panel of the CC Wifi and include an ethernet connection, headphone jack, line-out jack and power port (7.5 VDC). 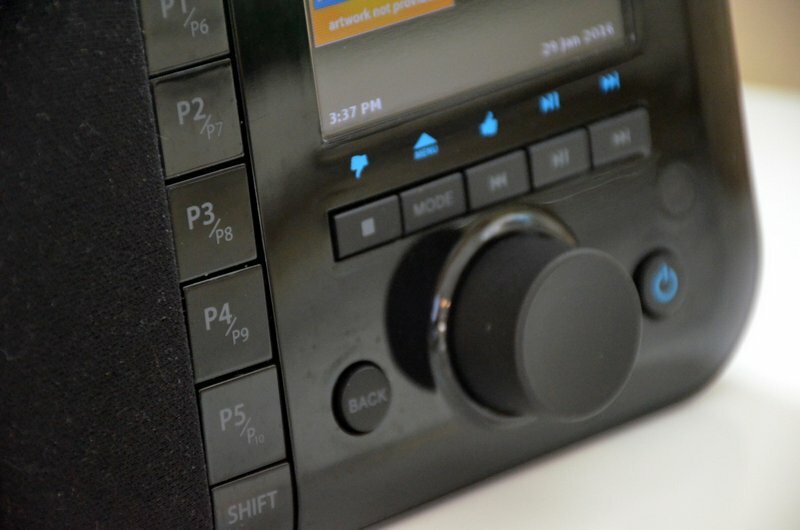 The CC WiFi only has three buttons on the front panel of the radio that act as dedicated memory presets. I wish this number were, at the very least, doubled. With the provided remote control, of course, memory presets are expanded to 99 allocations. Fortunately, you can pretty much operate the CC WiFi’s functions without the remote control (a bonus for those of us who tend to misplace tiny remote controls). 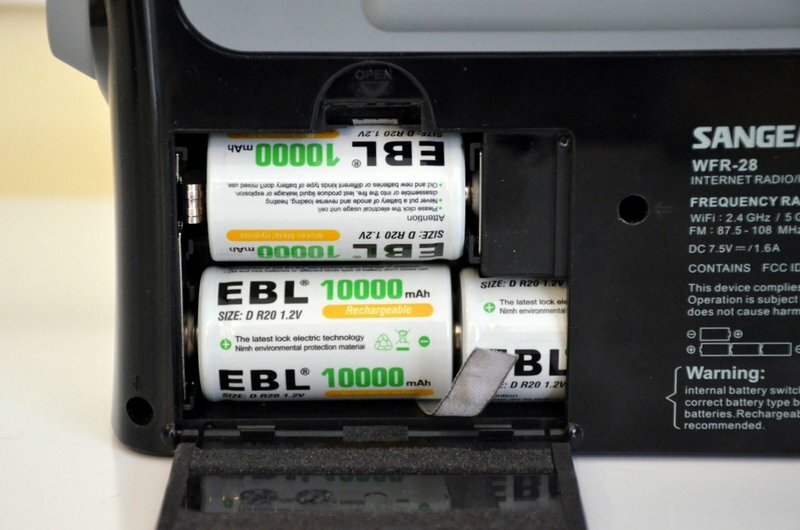 To help with portability, it would make sense to add a carry handle and capacity for internal rechargeable batteries. The CC WiFi requires a DC power supply to operate; this is a shame because I suspect other listeners, like me, often enjoy radio away from home where there are no main power outlets. The unit is small enough, and lightweight enough, that it would lend itself very well to portability. Though I’m sure the two-line backlit display was among the best in its class when the CC WiFi was introduced, I now find myself wishing this display could be a bit wider, taller, and (ideally) in color. 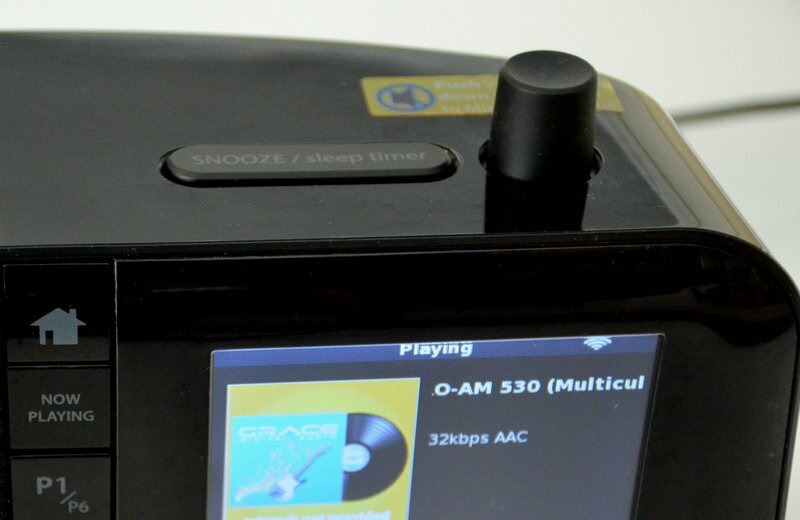 The display is small enough that if you’re browsing stations with the accompanying remote control, you need to be within a few feet of the radio. If it’s across the room, however, it’s very difficult to navigate. Additionally, the display width is not sufficient for longer Reciva station names/labels. As an example, I have a folder with local CBC stations from across Canada. Stations are labeled with the town or city name following, for example, “CBC Radio One – Toronto” or “CBC Radio One – Charlottetown.” When I’m browsing the folder of CBC stations, the display merely shows me a long list of “CBC Radio One” stations––which is to say, the truncated display cuts off the city’s name. Of course, I can press the right arrow on the remote to have the station name slowly scroll into view, but this is a cumbersome process when browsing the list. There are, of course, work-arounds for this––I could, for example, create folders for each city, or assign the station to a dedicated memory position––but the then I would have to drill down another level to find my station. “Work” around is the operative term, in either case, . 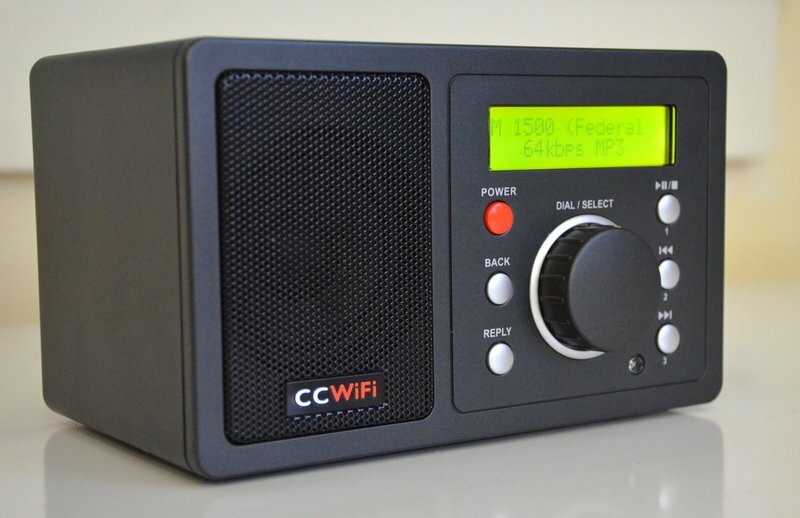 Overall, I think the CC WiFi is a good value and is currently one of the least expensive WiFi radios using the excellent Reciva aggregator. The CC WiFi has a surprising number of features for its price class. 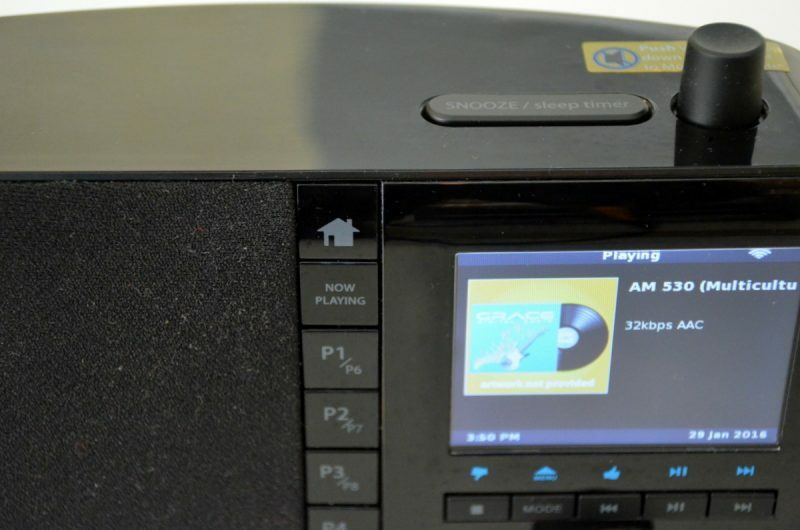 None of the criticisms above are necessarily deal-breakers, but some strategic upgrades to this radio would keep it competitive for many years to come. 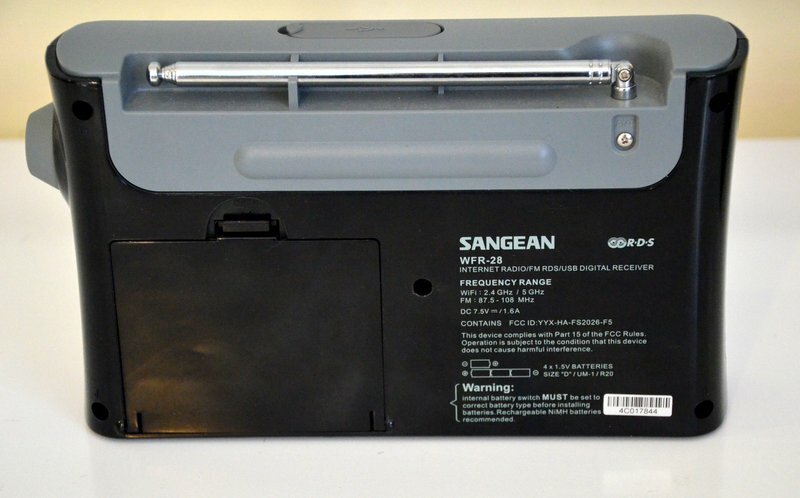 When I first unboxed the Sangean WFR-28, I immediately noticed its design, which bore a striking similarity to other Sangean AM/FM portables like the Sangean PR-D7. The WFR-28 has a glossy hard plastic body that feels robust and durable. 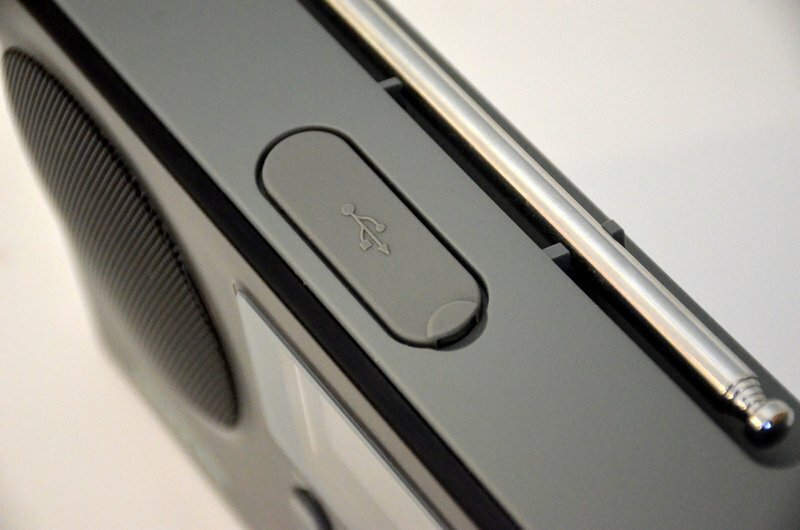 The buttons are spaced well across the front panel and have a tactile responsiveness and weight that speaks of quality. There is a dedicated volume rocker button, five memory preset buttons, as well as a dedicated tuning knob and five function buttons. The WFR-28 also has an easy-to-read square color screen that provides about five lines of text and can display any broadcaster artwork/logos provided. You can access all of the WFR-28’s functions by using the front panel buttons and tuning controls. As with most WiFi radios, doing so is not as enjoyable an experience as with most traditional radios, since you’re using a tuning control to move up or down through selections on a small display. The Sangean remote control app allows full control of the WFR-28’s functions. 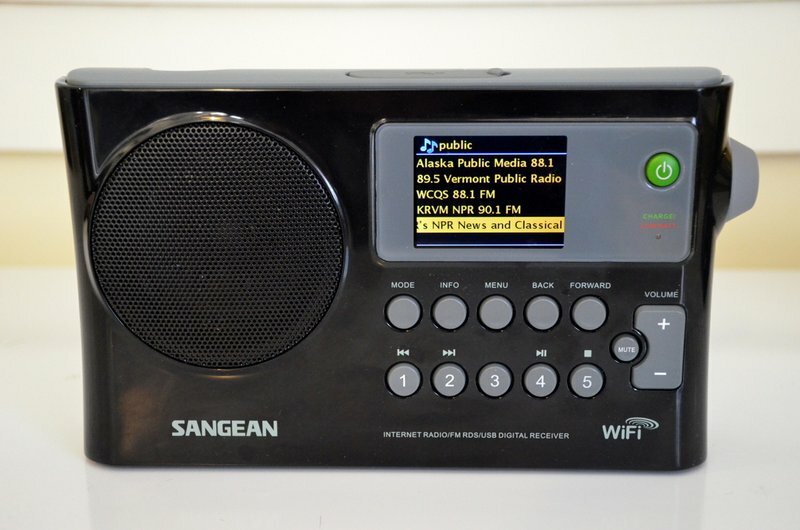 The Sangean WFR-28 does not ship with a remote; however, if you have an iOS or Android smartphone or tablet, you can download a free “remote control” app to control your radio. I find that this is actually more convenient than with a traditional IR remote, because you can control the radio functions from anywhere within your WiFi network. Not to mention, it’s great to be able to turn the volume up from another room in the house! 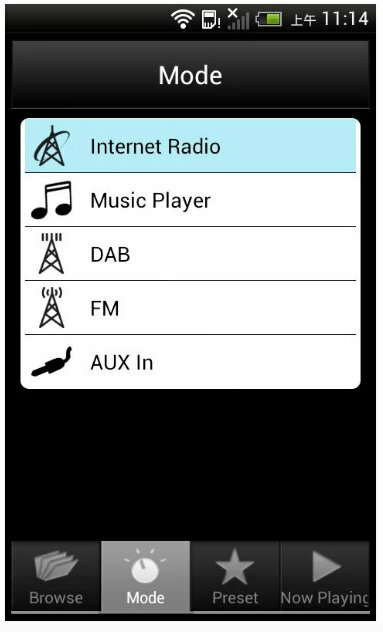 The Sangean remote app even allows you to control the various player modes: Internet Radio, USB, AUX in, and the traditional FM tuner. 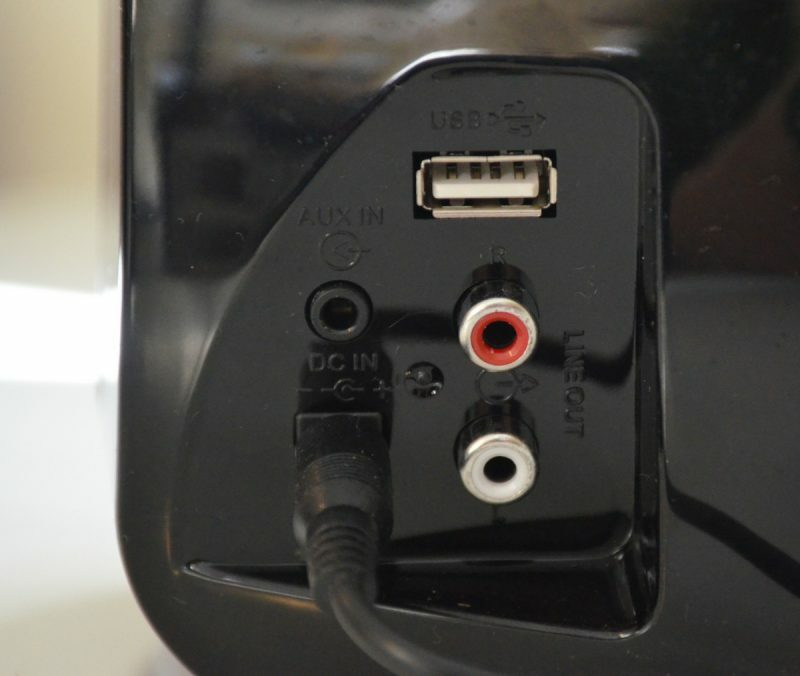 If you have a USB memory stick with audio content, you can play it through the WFR-28 via this handy, dedicated USB port on the top of the unit. Speaking of which, yes, the WFR-28 has a very good FM tuner. I can easily receive one of my benchmark distant-FM stations, and even successfully decode the RDS data––both the remote app, and the radio display FM station information. Nice touch, Sangean! The WFR-28 doesn’t ship with a battery pack: rather, it takes traditional D cells in either Alkaline or NiMH form. I purchased a four-pack of high-quality, high-capacity NiMH D cells––they’ll set you back $25-30, but are well worth the investment. The WFR-28 will internally recharge the cells when plugged into an outlet. Once fully charged, you’ll have hours upon hours of playtime. I haven’t measured the total playtime after a full charge, but I imagine it to be in excess of 24 hours. What is the WFR-28 missing? One obvious thing is a carry handle or strap, always useful. Other than that, it really packs a lot for a $122 radio. 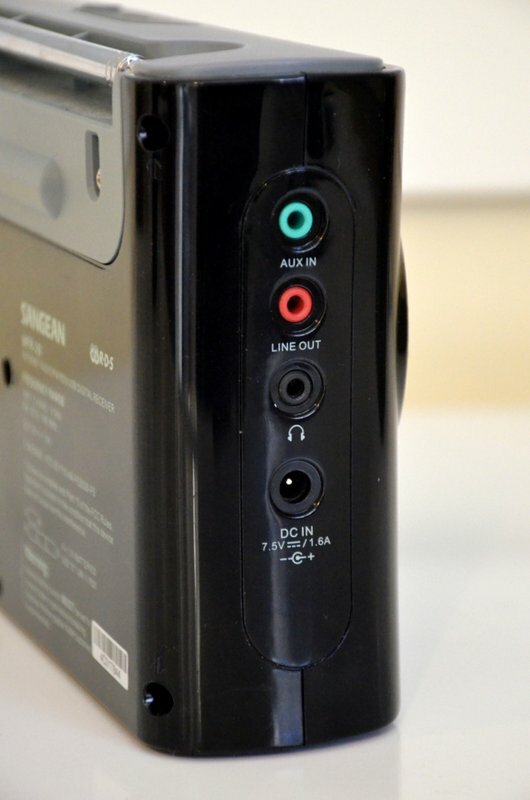 All of the external ports are on the left side (facing) of the radio. The WFR-28 has an auxiliary in, line out, headphone jack and power port (7.5 VDC). 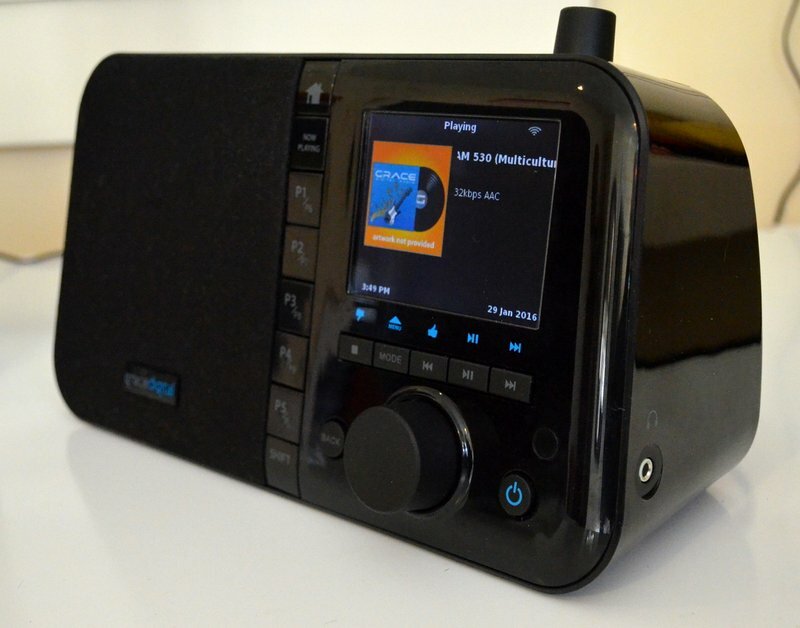 Overall, I believe the Sangean WFR-28 is an excellent WiFi radio; when combined with rechargeable D cells, you have a portable multi-function audio entertainment system that’s simple to use. I should note that I’ve also been pleased with the Frontier Silicon station aggregator, as well; although more simple than other aggregators, FS just happens to provide all of my favorite stations and networks (do check for your faves before you buy). Stay tuned! 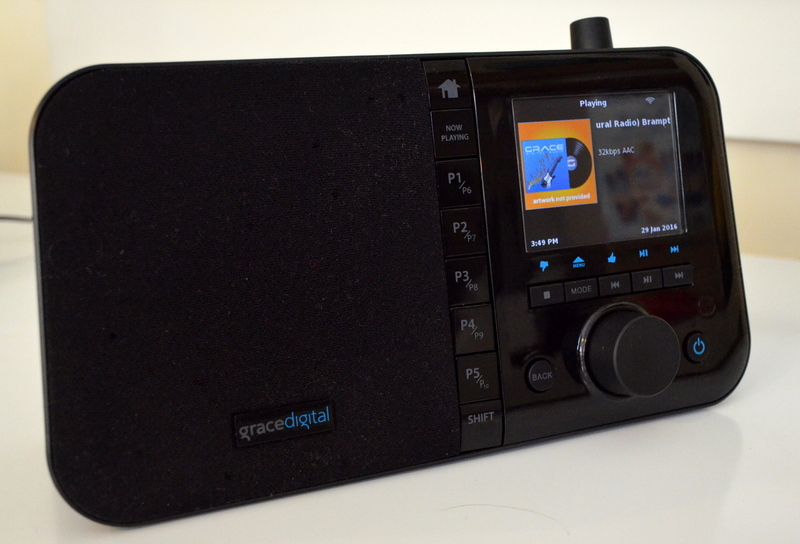 In Part 3 of our WiFi Radio Primer, we’ll take a look at two more WiFi radios: the Grace Digital Mondo and the Amazon Echo. 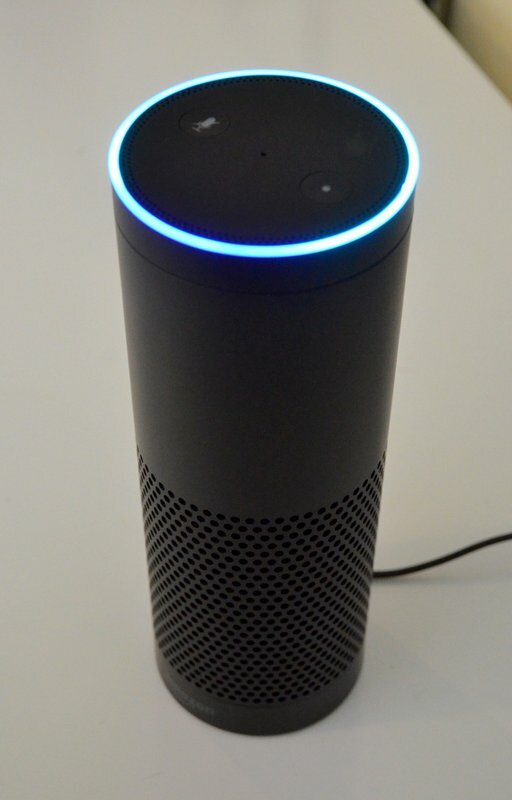 This entry was posted in News, Radios, Reviews, Web Radio, WiFi Radio and tagged Amazon Echo, C.Crane CC WiFi, C.Crane CC WiFi Review, Grace Digital Mondo, Sangean WFR-28, Sangean WFR-28 Review, WiFi Radio Primer, WiFi Radios on August 7, 2016 by Thomas. Thomas.. I know this isn’t quite SW news anymore, but Radio Kiribati usedto be on SW a while ago and is now on AM. I just found out something to those of us interested in Pacific radio signals. Radio Kiribati 1440 JUST started a live web stream…JUST…as in, like within the last few days! The audio levels can be a bit loud and overdriven at times, but i am corresponding with their Chief Engineer and the Radio station manager at the Broadcasting & Publications Authority in an effort to get levels set just right. The audio is average and I wouldn’t expect much more, quality wise, then what they’ve got now.. as most of these stations have hare basics when it comes to some equipment. The Radio Kiribati stream was just added to the Reciva.com database for internet radios and should be there soon if it isn’t already. The stream is at http://202.6.120.13:8000/ The stream itself is of amazing quality at 64k vorbis, which sounds good to my ears via my CC Wifi Radio and CCrane Senta speaker. Radio Kiribati only broadcasts local programming at certain times of day. Sometimes I’ll hear Radio New Zealand International outside of local broadcasting, other times I won’t. TX times are as follows…most of their programming is in their native language, which is Gilbertese according to Wikipedia. It’s a Micronesian language of the Austronesian language family. They do three segments of English broadcasting every day, some 30 minutes long and one is an hour long. Kiribati is UTC+14… at 416pm Thursday in Southwest Arkansas, where i am.. it’s 916am Friday morning in Kiribati. Feel free to post this to your own blog, website, Facebook group or page.. let’s spread the word!! Though pricey, I’ve heard the Pure Evoke F4 has fantastic audio and a meticulously curated database of Internet streams. This is one of the benefits of Wi-Fi radios and Internet streams: the ability to hear “local” stations–many of which used to broadcast on shortwave–from all corners of the globe. I’m seriously considering purchasing a Wi-Fi radio for my wife to make it a little easier for her to listen to Internet streams in her office. 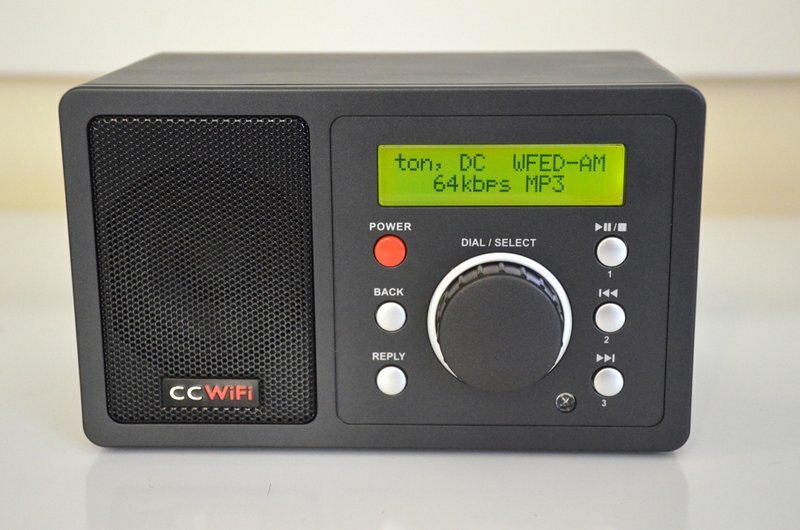 I’ve been looking at the C.Crane CC WiFi radio, the CC WiFi 2, the Grace Digital WiFi Music Player and the (much pricier) Pure Evoke F4 which my buddy, John Figliozzi, so highly recommends. Any suggestions and recommendations are most welcome. This entry was posted in AM, News, Radios and tagged C.Crane CC WiFi, CC Wifi 2, Grace Digital WiFi Music Player, Internet Radio, Pure Evoke F4, Radio Kiribati on October 5, 2015 by Thomas.